None of Us Are Free is a song written by Brenda Russell along with the famed Brill building husband wife songwriting team of Barry Mann and Cynthia Weil. If I didn't know better I would have thought that the song was an old traditional blues field holler or gospel song, although in retrospect I suppose the lyrics are a little more direct than those songs tend to be. It's hard to sing about how badly you want your freedom when the very person denying you your freedom is standing over you with a whip and a gun. Anyway, this song is another example of how talent doesn't really respect race. Although the song has an earthy black gospel feel, particularly in the version I heard, Mann and Weil happen to be Jewish Caucasians. So sometimes charges of cultural appropriation are balderdash. Either you have talent or you don't. Obviously these songwriters had talent. This song has been recorded by Ray Charles and Lynyrd Skynyrd but the version I want to share with you is one by late soul legend Solomon Burke with the equally legendary Blind Boys of Alabama on backup vocals. You really have to be someone to get the Blind Boys of Alabama to sing backup for you. And Solomon Burke was. Maybe that's another post. 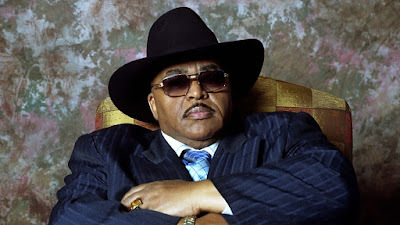 If you're not already familiar with Solomon Burke then you should become familiar with him. Anyway I really liked Burke's interpretation. The inspirational lyrics are simple but biting. The lyrics reminded me of so many different struggles. This song also reminded me that sometimes the collective is as important as the individual. This version was recorded live in the studio. It's not easy to find this sort of singing in what is today called R&B. I'm not saying that to be snide. It's just a fact. It seems as if resonant baritone and bass voices have been all but exiled from modern black American popular music. That's a shame. But so it goes. Anyway check out the lyrics and song below. None of us are free. None of us are free. None of us are free, if one of us is chained. None of us are free. And there are people still in darkness, And they just can't see the light. If you don't say it's wrong then that says it's right. We got try to feel for each other, let our brothers know that we care. It's a simple truth we all need, just to hear and to see. None of us can find it on our own. We've got to join together in spirit, heart and mind. So that every soul who's suffering will know they're not alone. If you just look around you, You're gonna see what I say. Cause the world is getting smaller each passing day. That the truth is shining real bright right before our eyes.